LINE-UP: Kevin (from The Common Men) will debut as our live drummer at our October shows! Kevin is a excellent drummer, and we hope to start writing some new songs this month - hopefully at least one will be ready by the Wilemina's show. 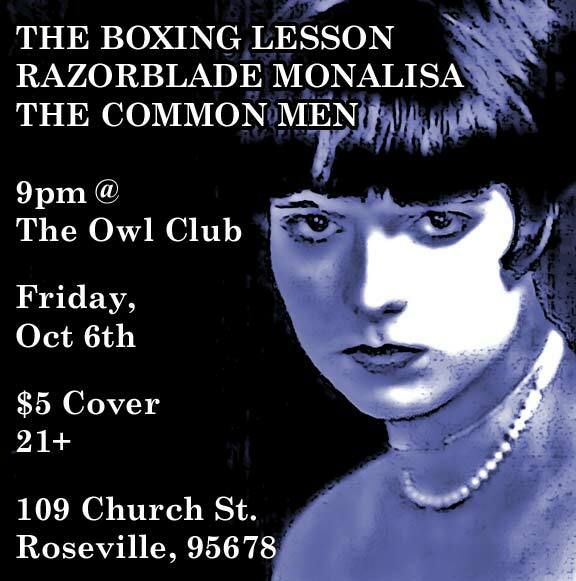 October 6 @ The Owl Club (109 Church St., Roseville, CA). $5 cover, 21 and up. With The Boxing Lesson and The Common Men. October 17 @ Willemina's (1023 Front St., Sacramento, CA). $6 cover, 21 and up. With Peelander-Z and Uberkunst. LINE-UP: At our super-secret August 12th show Dire (picture from our 2005 Halloween show at left) debuted handling 4-string bass and guitar. Jules will be playing more guitar in future (though not exclusively), and we're already writing new material. We are currently working on getting a new drummer and hope to play our first show sans keyboards very soon. IMAGES: We did a huge image update, including the 10/27/05, 10/30/05, 3/6/06, 6/13/06 and 8/12/06 shows, and added a new background picture to the image index. EP NEWS: We're about 95% done with the new song (provisionally titled "Pan"), once that is done, we hope to get a new EP released by Halloween, to include "Pan", "Wolves", "Picture Perfect", and "Ahab". 06/10/2006 - San Francisco show info. 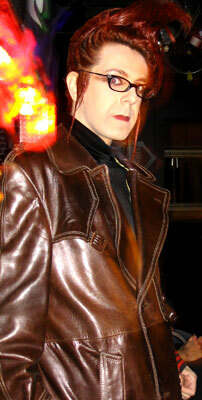 June, 13 2006 at Annie's Social Club (917 Folsom St. @ 5th St., San Francisco, CA 94107). Cost: $5, 21 and over, doors open at 9pm. We're opening for Human Value and Thee Double D's, so make sure to get there early to catch our set! 03/22/2006 - New song "Ahab" up! Download the MP3 here. There are also pics of the January 18th up too in the images section. 02/04/2006 - Razorblade Monalisa live album is out now! "Razorblade Monalisa 01.18.2006" is a direct from the mixing board recording of a show we did for our friend Nikki's birthday party @ NOIR. We are not really planning to release this as a CD, but as a free download album only. New song "Nowhere Now Here" makes it's debut on this disc, only after just writing it the previous week. It's still a bit rough, but fun none the less. The new song "Picture Perfect" is up! It's been decided that instead of focusing on getting a full album out, we should get together another EP with "Picture Perfect", "Ahab" (which is nearly finsihed), "Wolves" (we are working on now) and another song, possibly "Alien Nation". Having a second full album out would be nice, but we would rather spend our time writing some new material and integrating a live drummer into the band. And thanks again to everyone to saw us live in October! 09/28/2005 - RM live schedule for October. October 8 @ Greg Pond Studios (1412 21st St., Sacramento) with Spider Silk Dress. Free Second Saturday event. October 14 @ World 2 (11358 Sunrise Gold Circle, Rancho Cordova) with Sandi Leeper, Operation: Milksnatch, Spider Silk Dress, and Via Madrone. Benefit show for Katrina/Rita Hurricane Relief. Free admission, donations accepted. October 15 @ Trauma 7 in Country Club Events Center (2600 Watt Ave, Sacramento) 18+ 9 door, $5 admission. October 27 @ The Rapture in Club 21 (1119 21st St., Sacramento) 18+ 9 door, $5 admission. The Rapture's Halloween Event. October 30 @ NOIR in The Press Club (2030 P St, Sacramento) with Chemical Angel. 21+, 9 door, $5 admission. We have some new songs to debut, and a couple of new cover songs. I wont spoil the surprise, but this should be a fun month. 08/08/2005 - RM @ Club Touched (Bino's Birthday): Sunday, August 21. You too can be one of the 28 people to spank Bino (one spank per year)! August 21 @ the Press Club "Club Touched" (2030 P St., Sacramento) 21+ only, 9 door, $3 admission. Josh and Jules will be Guest DJing that night as usual at Touched. 07/14/2005 - RM @ Shady Brady's: Friday, July 22. We'll be the opening band for the Dismantled show @ Shady Brady's. Chemical Angel couldn't make it due to work issues, so we decided to help out. We are playing at 9 and will be playing a 30-40 minutes set, so make sure to get there early! 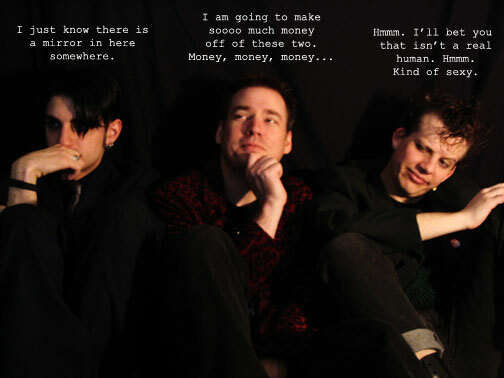 The major bulk of the site update is done, including much of the old Razorblade Monalisa content. The Discography pages have been updated for the most part, and we've got a ton of pictures from shows in the Images section. August 5 @ On the Y (670 Fulton Ave, Sacramento) 21+ 9 door, $5 admission. With Chemical Angel and Nilshiphter. June 19 @ the Press Club "Club Touched" (2030 P St., Sacramento) 21+ only, 9 door, $3 admission. Dire Delorean is the guest DJ. June 30 @ Club 21 "Rapture" (1119 21st St., Sacramento) 18+ 9 door, $5 admission. Razorblade Monalisa's Josh will be guest DJ. August 5 @ On the Y ($5, 670 Fulton Ave, Sacramento) 21+ 9 door, $5 admission. With Chemical Angel and Nilshiphter. The band: Are three. Bino on vocals, Josh on guitar, and Jules playing bass, keyboards, and maybe some guitar too. The name: We are using the "Razorblade Monalisa" name for now, until we can think up a new one. The songs: Are coming along slowly, but nicely. MP3s are to the left. We will have a 4 song E.P. ready by the time of our first show. The shows: Will be happening no later than this June. We'll keep you posted.